Slavic Village does public art well! From the RotoFlora and Pixelating Morgana, to the Broadway Arch and the Savannah Birdhouses, the neighborhood offers a series of unique public art elements unlike any others in the area! Pixelating Morgana began as a collaboration among artists Christopher Diehl, Shaun Breslin and John Troxel. The mural, the largest in the city (300–foot by-20- foot), now adorns the wall of the Lextech building along the most visible part of the trail. The abstract piece was a community effort and the artists welcomed visitors to the site as they were painting. Just a few blocks east of Pixelating is another impressive mural, known as the Common Things Mural. This 250 foot long work depicts neighborhood residents enjoying themselves in all manner of active recreation, from biking to swimming on a small manufacturing building facing the Trail. This mural was designed and drawn by Alex Nosse. In-between these murals is the unique series of Dana Depew and Chuck Gliha’s Savannah Birdhouses at home in the Slavic Village Savannah adjacent to the new housing development – Trailside Slavic Village at E.71st and the Trail. At the Trailhead of E.49th St. and the Morgana Run Trail stands the 35-foot-tall sculpture known as RotoFlora by Jake Beckham. 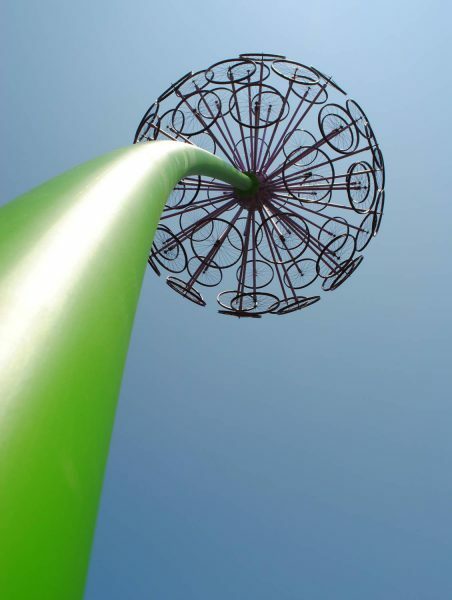 Designed to look like an allium flower, the sculpture is made up of bicycle rims atop a steel stem. The sculpture visible from I-77 was created in support with LANDStudio and fabricated by Signature Sign Company. Cycle of Arches a bold place-making piece of public art that serves as the Northern Gateway to the Broadway Slavic Village community located at the intersection of E.49th St. and Broadway Ave. The Arch, a variation on the traditional street arch, was designed by Jonathan Kurtz to provide a profound and unexpected visual experience from every viewing perspective and is lite at night. The vision is a design that is meant to evoke allusions to nature (trees or grasses bent by the wind) and interpret our industrial heritage by invoking the neighborhood’s “steel roots” with its steel tubing construction. The Arch had multiple funding sources including: Ohio & Eric Canalway, Ohio Capital Corp. and LANDStudio. The adjoining greenspace (Arch Park) was just awarded a Green Infrastructure grant by the NEORSD in 2016 and will be developed into a new greenspace. Further along the Broadway Byway you will find another community mural known as The Grandmothers, located on the side of a commercial property at 5728 Broadway. Drawn by artist Crystal Burns, dozens of community volunteers helped paint this mural that also depicts some of the community’s historic sites. The project was funded by Broadway School of Music & the Arts. The mural known as A World Built of Sweat and Steel graces the side of another industrial building located at 7835 Broadway Ave. This mural depicts the story of steel, a story that started here in the Slavic Village community in the late 1800’s. 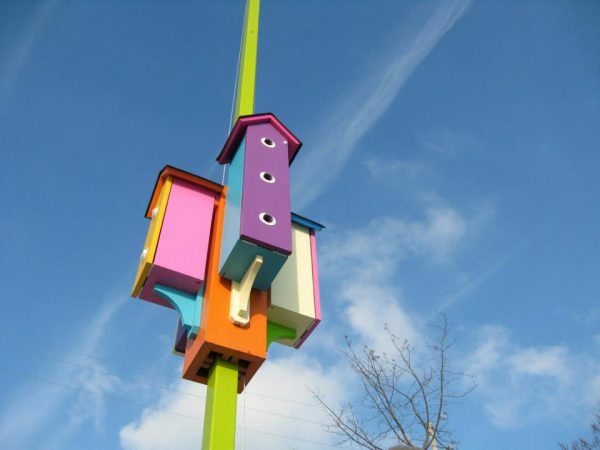 The project began as a collaboration between Christopher Luciani, former Cultural Arts Manager for the City of Cleveland, Ohio, and well- known artist, John Rivera-Resto. The painting of the project included some student “apprentices” and proceeded over the summer of 2012. Unfortunately, the painting of the mural was interrupted with about 100% of the mural drawn and only 90% painted. The mural awaiting completion and even in its unfinished state is still a remarkable work of art! Newburgh Park using interpretive public art to honor the industrial and historical heritage of the community is located at the intersection of Broadway Ave. and Harvard Ave. along the Byway. Utilizing original (1898) bridge stones from the E.49th St. Bridge restoration project for seating , 30” tall letters spelling out “Newburgh” and an “industrial artifact” to represent the industrial heritage of the neighborhood along with new trees, a new Transit waiting environment (TWE), plantings, swings and pathways the park creates a new stop along the Broadway Byway. 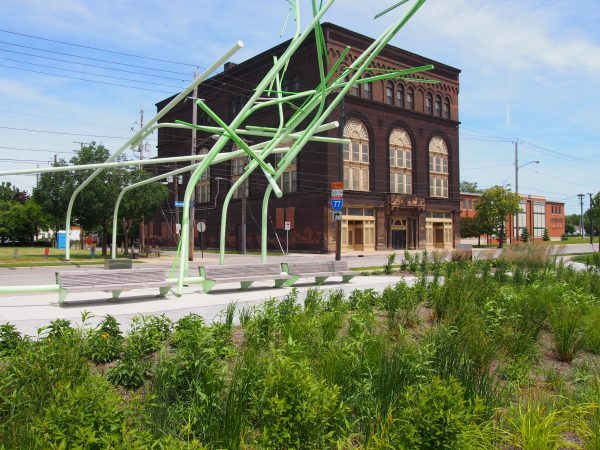 The project transforms vacant land and creates an opportunity to connect visitors and residents alike to the Broadway neighborhoods and their past and was funded by a ReImagining Grant from the City of Cleveland and Cleveland Neighborhood Progress. The Mill Creek Falls MetroParks Reservation located just off Broadway Ave. at Warner Road and Webb Terrace has several interesting pieces of public art. The first is several pieces of wrought iron Art Fencing designed by Brinsley Tyrrel. Joining the Tyrrel art is also a Stone Sculpture by Rod Defoe. The setting is completed with a small open air amphitheater with stone seating inscribed with quotes by famous Americans. Dragon Park is located in the Warszawa Historic District along E.65th St. just south of the beautiful St. Stanislaus Catholic Shrine Church. 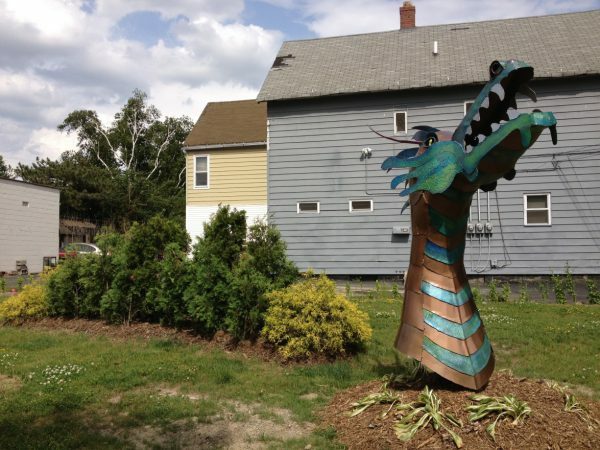 Dragon Park was envisioned by a group of local residents who had the dragon head fabricated to be part of a topiary project. Several art events have become staples on the Slavic Village social and entertainment calendar. These include the annual the Warszawa Music Festival held throughout the summer; and Rooms to Let CLE ! Be sure to stop back regularly and check out all the new art work happening in SV!